In the construction industry, asbestos is found in installed products such as sprayed-on fireproofing, pipe insulation, floor tiles, cement pipe and sheet, roofing felts and shingles, ceiling tiles, fire-resistant drywall, drywall joint compounds, and acoustical products. Because very few asbestos containing products are being installed today, most worker exposures occur during the removal of asbestos and the renovation and maintenance of buildings and structures containing asbestos. This course is intended primarily for civil and construction engineers involved in construction activities. 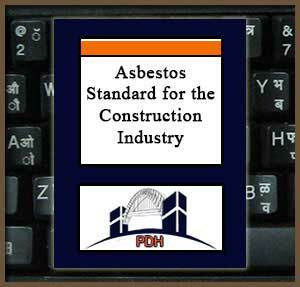 This course is based on the OSHA 3096 document, “Asbestos Standard for the Construction Industry,” 2002.